Feng shui exterior house color choices make wading through a vast number of color charts easier. While a color cannot activate an element, it certainly can provide a psychological effect. In addition, colors are assigned to each compass direction. This information may be used as a tool for deciding on your feng shui house color. Compass directions are vital to a proper feng shui application. If you don't know the sitting and facing directions of your home, you certainly can't use classic compass and form schools of feng shui. Using a compass you want to stand in the center of your home and face the front side of your home. This will give you the facing direction for your home. This means that the back of your home is the facing direction. The facing will always be the opposite of your sitting direction, for example, if your home sits in the Northwest, then the facing direction is Southeast. It can be very helpful to consider the sitting direction when deciding on your house color. A chart showing the colors for each direction can be a great tool to use in this process. 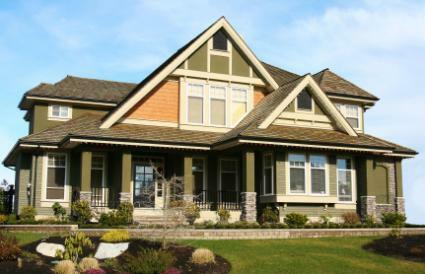 The trim and door colors of your home can change the overall appearance of your home dramatically. If your home sits in the North direction, you don't have to paint the entire structure black or dark blue. You can instead use the direction colors for North for your trim and door, opting for dark blue trim and a black door. If your home is in the South sitting position, you could use the fire symbol color of red for your door color. Don't be afraid to mix and match, since the color guide is an illustration of the colors assigned to each compass direction. You may decide to be bold and incorporate elements in your overall exterior colors. Go beyond the concept of a painted house for your color palette and incorporate the surrounding shrubbery and other landscape materials, such as stone patios and walkways. For a West sitting home, you might decide that you want to place a brass kick plate and door knocker on your front door. The brass will activate chi energy and attract it into your home. Adding a wood bench in the Southeast or East sector of your yard is one way to introduce the wood element. Plantings attract wood chi energy. Blooming plants are a great way to add more color to the exterior of your home. You might want to plant shade plants with blue and dark blue blossoms. Bright red, orange, white, yellow and pink flowers are great colors addition to the South and Southwest sectors. Make sure that any plants near an exterior door don't have sharp or pointed leaves that will create poison arrows. Poison arrows can prevent positive chi energy from entering your home. The important thing to remember whenever selecting exterior colors for your home is that the color won't activate chi energy, so if you love blue and your house sitting position is South, don't feel as though you're limited to fire colors. First and foremost, you should select paint colors based on personal likes. If you don't like blue but love yellow, then you should go with a color that will make you feel good whenever you go in and out of your home. Take the time to plan out your landscaping so you incorporate a wide range of colors along the rest of the exterior of your home.